The GFS, NAM, and EURO show a severe weather threat Monday, November 12th, but defer on how far the threat extends inland. 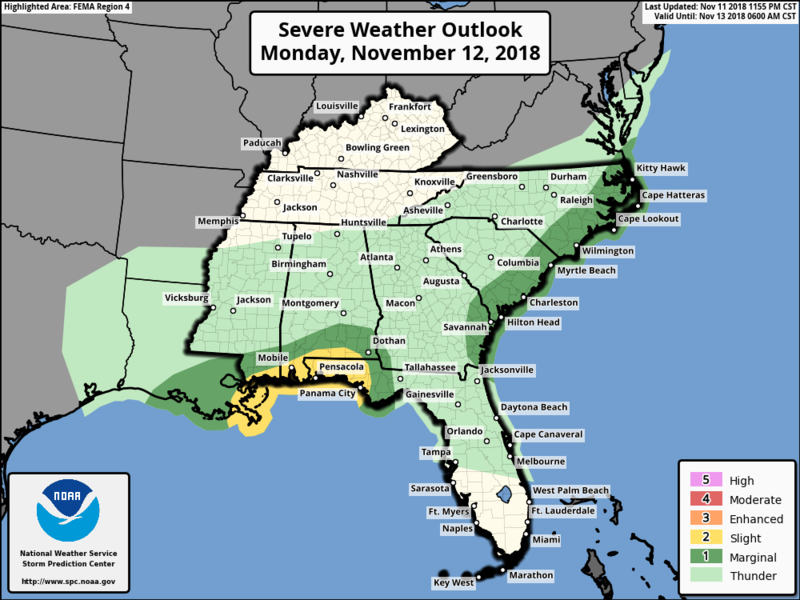 The EURO has been adamant about getting it further north into central Alabama, and Georgia, whereas the GFS, and NAM have been hesitant to bring the threat inland until recently. 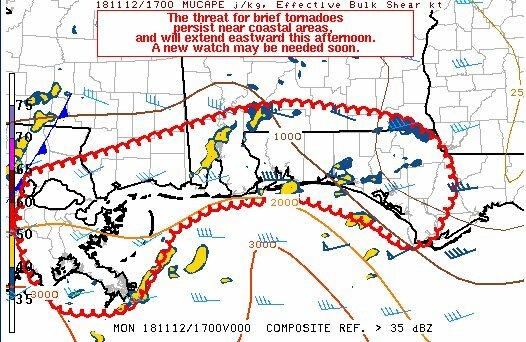 They only get areas such extreme southern LA, MS, AL, GA, and northen FL, and the panhandle in on the threat. Regardless, with either solution there looks to be a heightened threat along an area near the surface low riding the warm front. There are two areas that could get really interesting tomorrow, and it looks quite possible. The first one being southern LA, MS, AL, GA, and the Florida panhandle. Then the other being coastal South Carolina, and North Carolina. CAMs are showing high supercell, and significant tornado parameter values. SPC has slight risk along the immediate Gulf Coast w/5% Tornado Probs. Coast, and across the coastal Carolinas Monday night. much of the eastern CONUS. a result of cell mergers and/or frontal circulations. resulting potential in these areas for surface-based storms. for updraft rotation with the more persistent warm-sector storms. is possible with any of these low-topped supercells. Tornado on water probably with that storm south of Gulf Breeze. Watch it closely as it is about to come onshore. * Until 945 AM CST. of Gulf Breeze, moving northeast at 25 mph. Gulf Breeze and Pensacola Beach around 910 AM CST. Oriole Beach around 920 AM CST. southeastern Santa Rosa and southeastern Escambia Counties. Tornado watch is probably coming shortly. There’s been a pair of two rotating supercells over the water south and west of Panama City, and Mexico Beach for a long time. They look to be moving onshore soon.